Camping requires significantly more water than Hiking. So make sure that you have the extra gear required to meet your needs. Carrying water with you while you hike to and from your campsites is a necessity. Since you need approximately 1 pint (16 oz) of water per hour to be fully hydrated you need to find a way to balance the water you carry with the water you drink while hiking. But with water weighing 2.2 lbs per gallon carrying too much water gets heave very fast and forces you to leave behind other items that you might need in the backcountry. So you need a “tiered” system that allows you to carry some water and then find, store and use other local water that you find while camping. The criteria that we use to evaluate water bottles are: 1) volume of water stored, 2) ease or drinking on the move, 3) tightness of seal, 4) ease of refilling, 5) amount condensation sweating that accumulates on the bottle, 6) ability to attach to a backpack and 7) price. To stay hydrated while on the trail we carry a 20 oz Camelbak Eddy which seems to be a good balance between having all the water you need and carrying a reasonable amount. 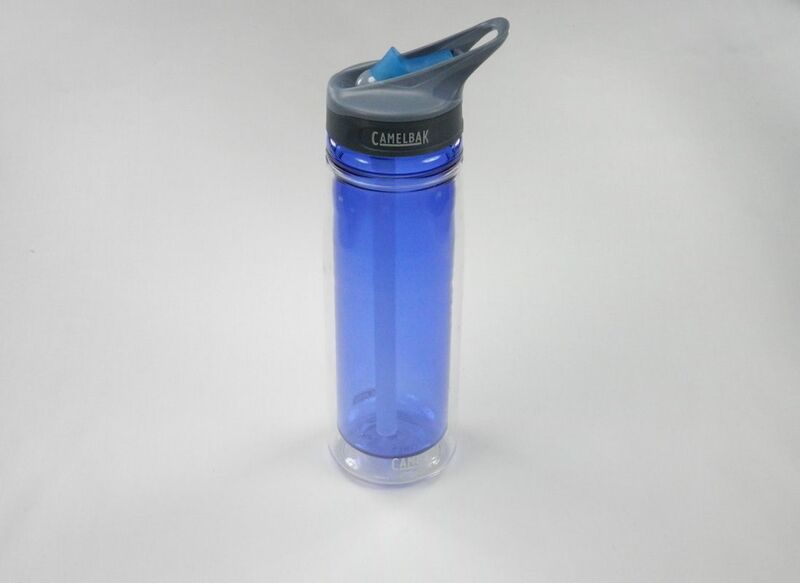 We like the fact that the bottle is made of a durable plastic that has two layers to prevent condensation. The “bite valve” makes it easy to use on the trail without spilling it and the built-in loop on the cap makes it easy to carry or attach to a pack. You can buy this water bottle at Amazon. Since you may not be able to carry all the water that you need for your trip into the backcountry, the second part of our “tiered” water system is a life straw. This allows us to carry some initial water in our Camelbak Eddy and to then refill it when we find other water (from a tap at a ranger station, from a stream, etc.,) during our hike. The criteria that we use to evaluate life straws are: 1) purification level, 2) ease of use, 3) ease of extracting water to store in another container – not just sip and 4) price. 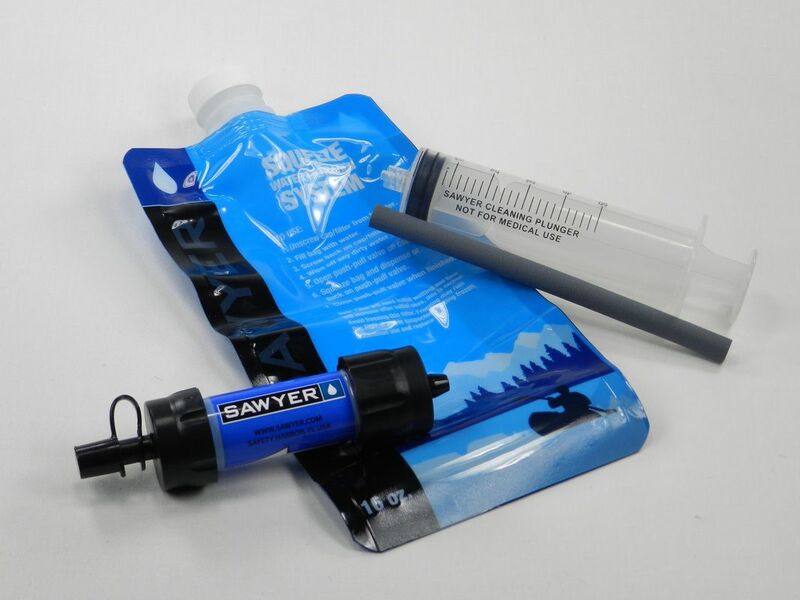 The Sawyer Products Mini Water Filtration System does a great job meeting our needs. The filter removes 7 log (99.99999%) of all bacteria (like salmonella) as well as other harmful bacteria which causes cholera and E. coli and 6 log (99.9999%) of all protozoa such as giardia and cryptosporidium. The Sawyer Mini weighs in at 2 oz,, can filter up to 100,000 gallons of water, can screw onto most water bottle tops, includes a 16-ounce reusable squeeze pouch a 7-inch drinking straw and cleaning plunger. You can buy these life straws at Amazon. Once you have stopped to camp your water needs usually skyrocket since everyone will want a nice long drink after the hike, you need to cook a meal and everyone will need some water for hygiene purposes. This is where the third “tier” of the water system comes in; filtering a large volume of water. The criteria that we use to evaluate water filtration systems are: 1) purification level, 2) ease of use, 3) ease of extracting water to store in another container and 4) price. 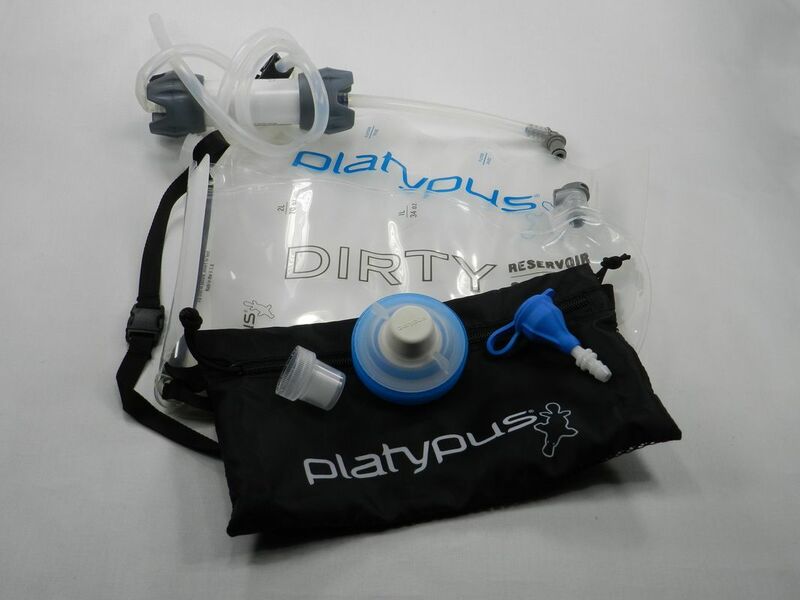 What we like best about the Platypus 2L GravityWorks Filter is that it works based on gravity feed – so no pumping is needed. With gravity on your side the system can filter/clean 4L of water in less than 2.5 minutes. The filter life is rated at 1,500 liters and can be easily cleaned by back flushing it with clean water after using it. You can buy this water filtration system at Amazon. As a last resort we also carry Water Purification Tablets with us in the backcountry as our fourth tier in case we have to drink really suspect water. The criteria that we use to evaluate water purification tablets are: 1) amount of bacteria/viruses/cysts killed, 2) volume of water purified and 3) time to purify. 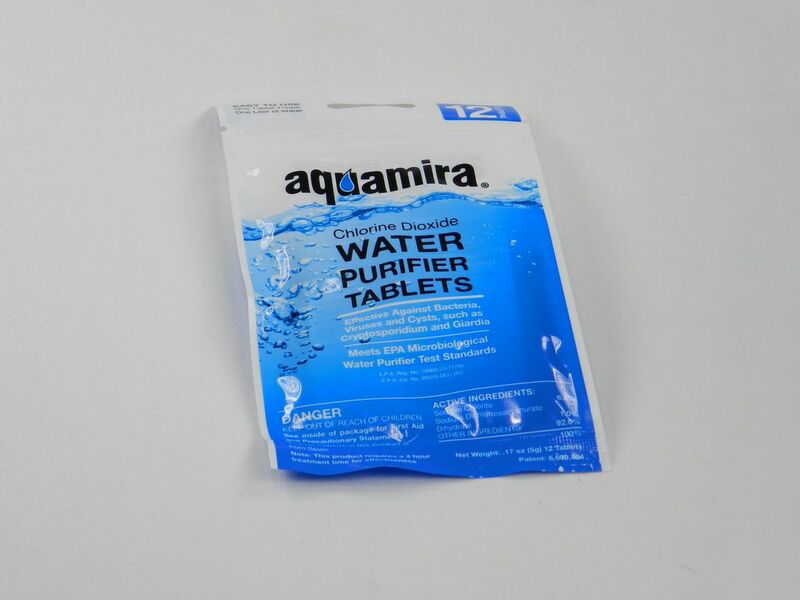 If we do have to use water that needs to be purified with tablets we first filter the water through the Platypus 2L GravityWorks Filter or Sawyer Mini and then add Aquamira Cholrine Dioxide Water Purification Tablets. We like these tablets since they kill 99.99% of the waterborne pathogens (better than iodine or chlorine bleach) but has no bad aftertaste. Each tablet purifies 1 liter (34 oz) of water and takes approximately 4 hours to work. You can buy these water purification tablets at Amazon. Of course, if you are filtering and using a lot of water you will need a container to hold it in. The criteria that we use to evaluate water jugs are: 1) volume of water held, 2) ease of filling, 3) ease of pouring and 4) travel size. We use the Reliance Fold-A-Carrier Collapsible Water Container because it is very flexible and compresses well when traveling but then folds out to hold 2.5 liters of water at the campsite. The integrated on/off spigot allows us to fill it from our filtration system and to then pour straight from the container into our pots or hands. 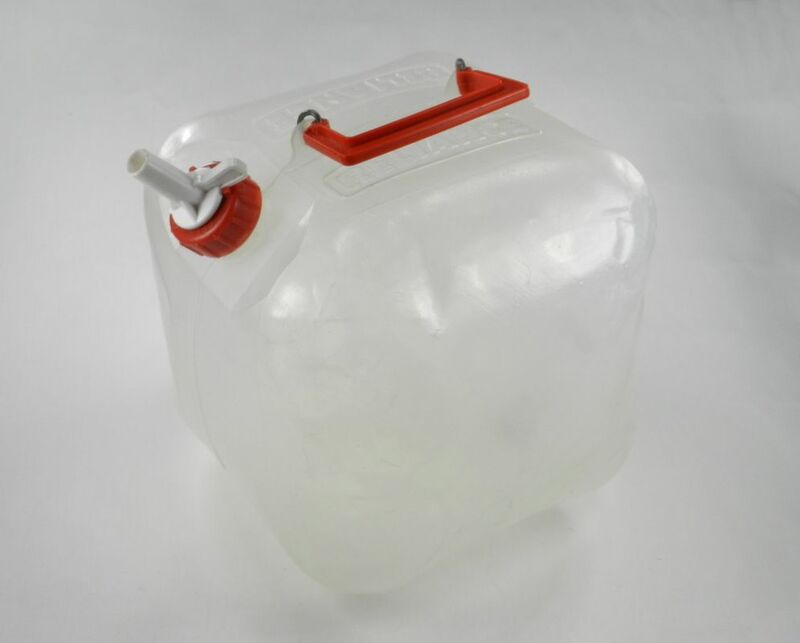 The jug is made out of BPA-free, food-approved high grade polyethylene. You can buy this water jug at Amazon.